My Bristol 401, christened Daisy. Daisy has been found and acquired in May 2001 from her first owner family. She has not turned a wheel since the early eighties (see abandoned in an open parking space), and was in dear need of restoration. 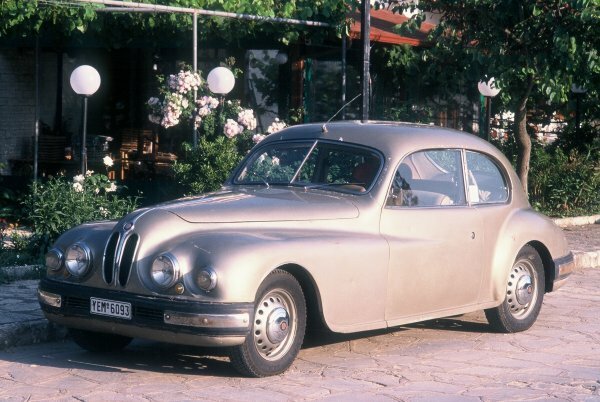 After 3 years of work on the structural and mechanical systems, Daisy participated in the Bristol Owners Club to Greece trip in May 2004, covering a total of 2.500km! She concluded the trip with a blown head gasket, which prompted a full engine rebuild, finished just in time for the Bristol Owners Club trip to Tuscany in May 2006, another 2.500km. She still needs to go to the "Beauty Salon" for her exterior looks, but at least she gives us great pleasure during her running restoration!